Clean needles, chairs, naloxone, a couple people trained in CPR, and shelter from the rain. 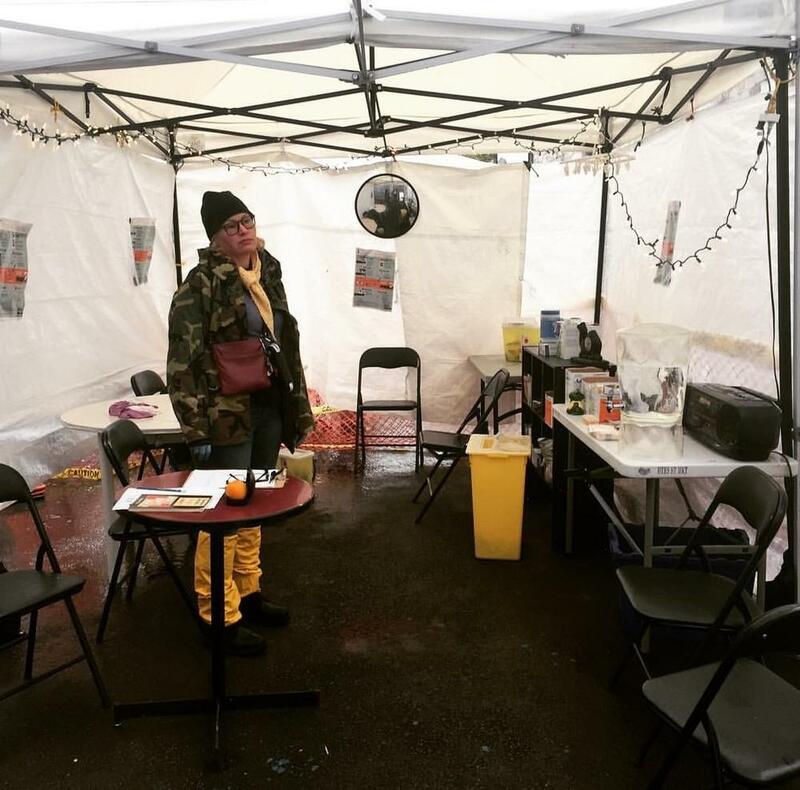 These are the basic elements of a do-it-yourself supervised injection site, so says the operator of a back alley “harm reduction tent” recently opened in Vancouver’s Downtown Eastside. One of the tent’s founders, Sarah Blyth, told VICE the site is a response to the neighbourhood’s opiate overdose epidemic. Blyth, who also helps run the weekly Downtown Eastside street vendor markets, said she and other frontline workers wanted to set up something more consistent and street-level after hearing calls for help in the streets. “You’re in the middle of it, you’re seeing people ODing, and you just can’t believe that there isn’t more help,” she told VICE. The tent is covering gaps left by Vancouver’s safe injection site Insite, which Blyth says is “packed” and unable to respond to street-level emergencies. “It’s not Insite, it’s not supposed to function as Insite,” she said. Blyth set up the tent with Vancouver Area Network of Drug Users (VANDU) founder Ann Livingston last Wednesday, and so far city and health authorities haven’t given them any trouble. Even as the royal circus passed down Hastings Street a half-block away, with a heightened security presence at the street market, Blyth continued her harm reduction project uninterrupted. The same day it opened, British Columbia’s coroner released new stats that showed fentanyl is showing up in recreational drugs, as well as street-level opiates. The super-potent synthetic opioid has caused over 60 percent of overdose deaths across the province in 2016. So far this year, overdoses have killed nearly 500 people. Blyth says fentanyl has made overdoses more deadly, requiring frontline workers to respond quicker. When a batch of bad drugs is in circulation, she says the back alleys around Hastings can turn into a “warzone” where many people in a row go under, sometimes within minutes of each other.